With the 10th pick of the 2018 NBA Draft, the Philadelphia 76ers selected Mikal Bridges. A night that started like the NBA’s next feel good story, ended in a hearbreak. Bridges, a two-time NCAA Champion with Villanova, was drated to his hometeam. His mother, Tyneeha Rivers, is the Global VP of Human Resources for Harris Blitzer Sports and Entertainment, the company that owns the Sixers. It was perfect. But while Mikal went on his draft-pick PR tour, the feel-good story turned into a nightmare… possibly a dark humor comedy. While talking about how excited he is to play with Joel Embiid and Ben Simmons, he was traded to the Phoenix Suns. Being traded from your hometeam alone is frustrating, but being traded from a contender to the worst team in the league? I can’t even imagine. Fast forward to the present day; the Suns are even worse than anticipated and have just set an NBA record as they became the first team in the shot clock era to score under 10 points in back-to-back 1st quarters. Even more concerning for the franchise? The relationship between players and the coaching staff. 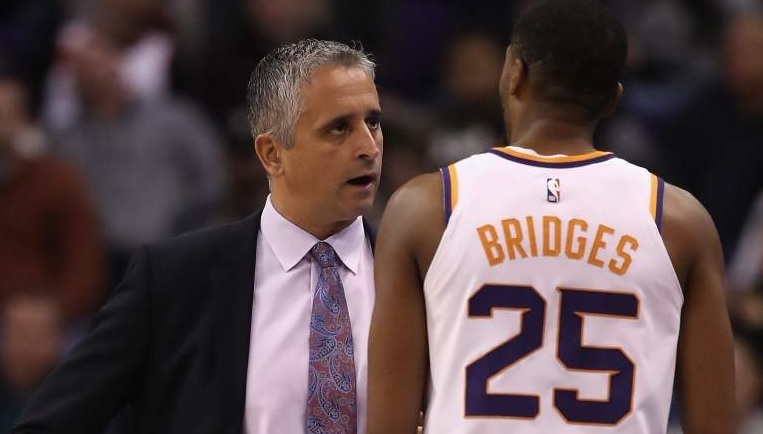 When Bridges was called for his fifth foul of the night in the third quarter against the Blazers last night, coach Kokoskov called a timeout and approached Bridges to talk over his mistake on defense. Bridges though, was having none of it and disregarded his coach in front of everyone.